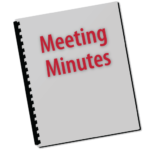 Call Meeting to Order- Chairperson Gundle-Krieg called the meeting to order at 6:37PM. Roll Call- Mr. Biskupski called roll for the business meeting. Present- Chairperson: Donna Gundle-Krieg, Vice-Chair: Ben Boren, Officers: Ben Schultz (joined @ 7:10), David Holmer and Peter Biskupski.